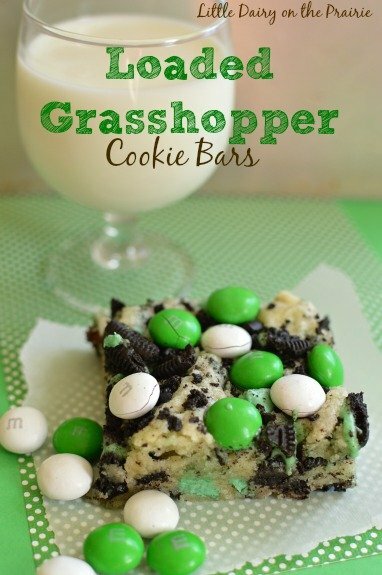 These cookies are should actually be named “Over” Loaded Grasshopper Cookie Bars! They begin with a melt in your mouth sugar cookie, from a mix. Every bite is an explosion of minty goodness! 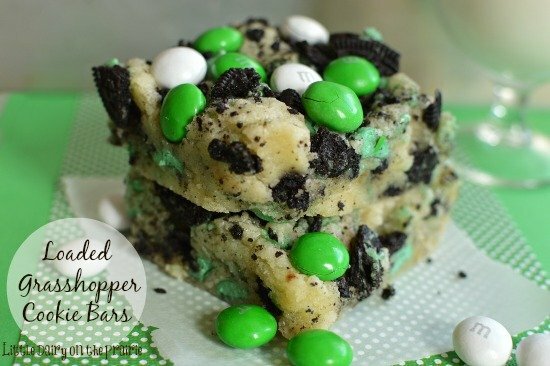 They are perfect for celebrating Christmas of St. Patties Day! Mint chocolate chip is one of my all time favorite flavor combinations. 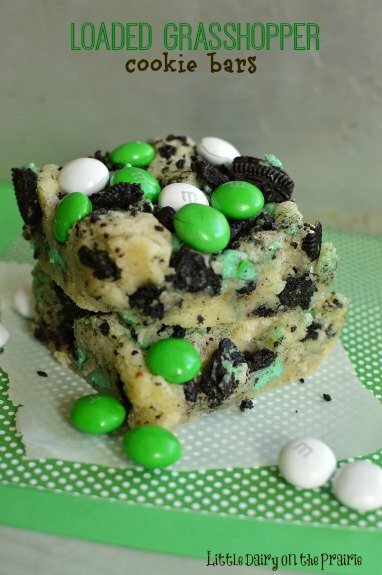 Seriously, I could eat and entire package of Mint Oreo’s in one setting. I eat one and then another and then another, etc. Eventually I have to tell me kids “no more”. I make it sound like they are eating too many and need to get themselves under control. 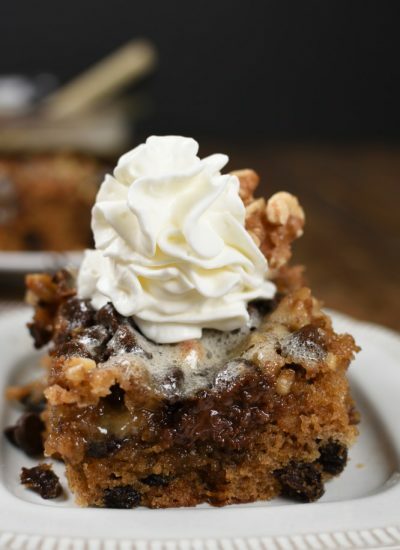 Well, these Loaded Grasshopper Cookie Bars have the same affect on me! I started by making a Betty Crocker sugar cookie mix according to directions. Except I added mint extract. If you are ambitious you could make your own. Next I stirred in some chopped Mint Oreo’s, Ande’s Mint chips, Mint M&M’s that I happened to have leftover from Christmas. (I always save a few for St. Patrick’s Day. I add the red ones to a Valentines Day mix.) 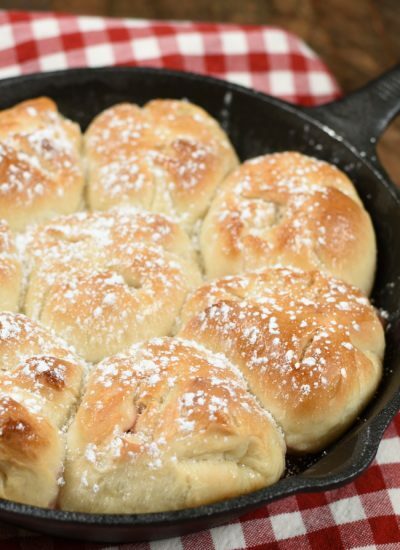 Stir the goodies in and spread in an 8″ x 8″ pan. I topped my bars with additional M&M’s. Just for good measure. Bake. Cool. And Eat! 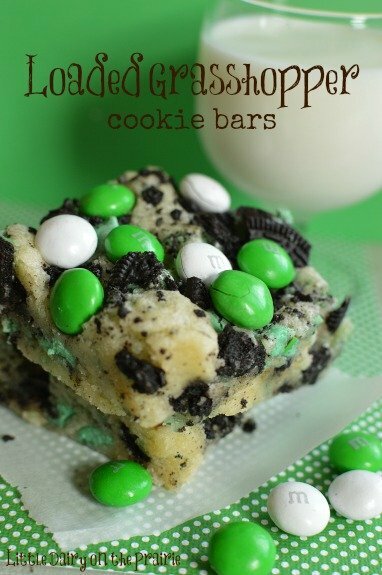 You are going to love the explosion of minty goodness in every single bite! By the way, these really should be eaten with a cold glass of milk! In the first place milk is good for you. In the second place, I make money when you drink it. And in the third place, Oreo’s in any form go with milk! These were a cinch to throw together. I love how festive and cute they are for celebrating St. Patties Day or Christmas. Really they taste just as good any other day too, but they are extra fun for celebrating. 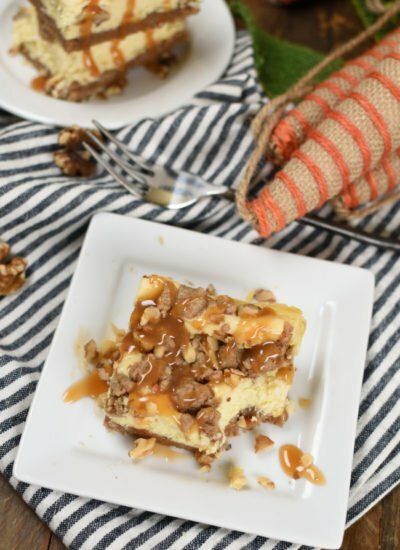 FOR THE CRAZY EASY (AND YUMMY) RECIPE CLICK HERE! Now I have to make a confession. Justin is taking some additional EMT training. The course he is taking will certify him to be able to give IV’s. Scary, huh? Thank goodness I escaped him taking the course without being stuck. Although I must admit that I considered telling my 7th grader that if his homework assignment wasn’t done properly he would have to go to the EMT class so that he could be stuck. Then I remembered that he would probably much rather do that than do his homework! Anyway, back to the confession. I decided that I would make some kind of minty cookies to send to his class with him. 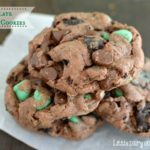 I was in a huge hurry that day and decided to turn one of my other favorite recipes into some minty good cookies. Guess what? They were dry and not that great. They weren’t cute either. 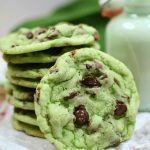 I tried adding green food coloring to the cookies, but they really didn’t turn out that green. Justin said his class ate them without complaining. Let’s face it. They aren’t going to sit there and talk about how bad he cookies are, besides they still tasted okay. The next day I went to work on perfecting my mistake! And I’m here to tell you that the second time is a charm! After some tweaking the next batch was amazing! Don’t mess around trying to conjure up some other amazing recipe and go straight to this one. They are the best! 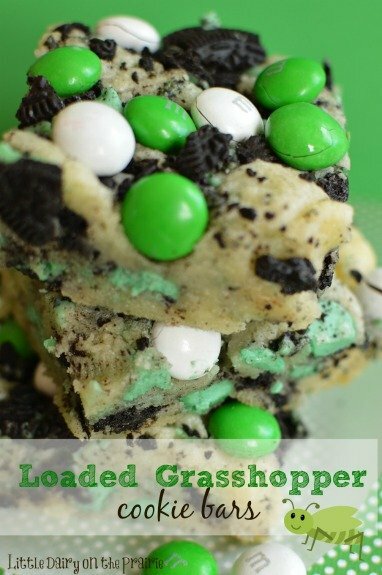 These cookies are should actually be named "Over" Loaded Grasshopper Cookie Bars! They begin with a melt in your mouth sugar cookie, from a mix. Every bite is an explosion of minty goodness! 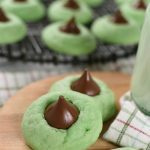 They are perfect for celebrating Christmas of St. Patties Day! Preheat oven to 350 degrees. Line an 8" x 8" baking pan with aluminum foil. Grease. 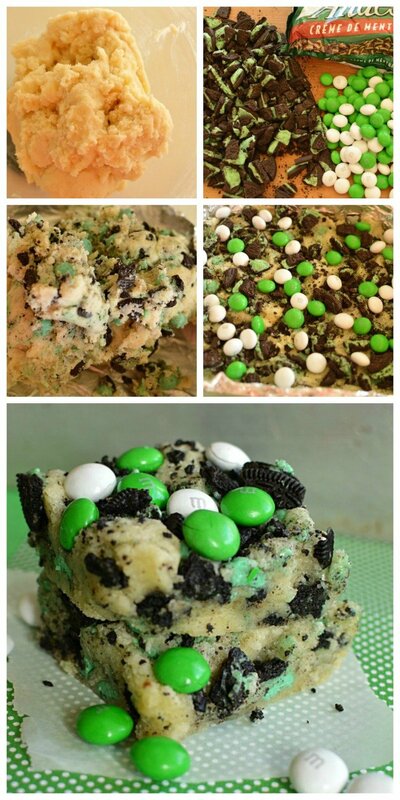 Stir Oreo's, Ande's Mint Chips and 1 cup M&M's into the sugar cookie dough. Top with reserved M&M's. Press lightly into cookie dough. Cool. Cut in to bars. St Patrick’s Day always reminds me of my Mom, and she loved mint as well. And one of my favorite colors is green, so it is a perfect holiday to combine all kinds of things into something yummy to eat. Maybe you could make another batch of these cookies and let Justin share them with all of the EMT’ers. Those are all good things! Thank goodness Justin finished his class so he doesn’t need anymore cookies! You had me at explosion of minty goodness! I love how full of treats these bars are!!! 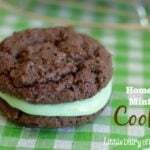 Chocolate and mint are one of my favorite flavor combinations! I just some brownies like this, But these look so much bette!!!!! THanks for sharing at the Weekend Retreat, hope to see you back on Thursday. Thanks! Mint and chocolate are irresistible to me! I can’t get enough of it! If your using the 16oz sugar cookie mix, what’s the refrigerated dough for? 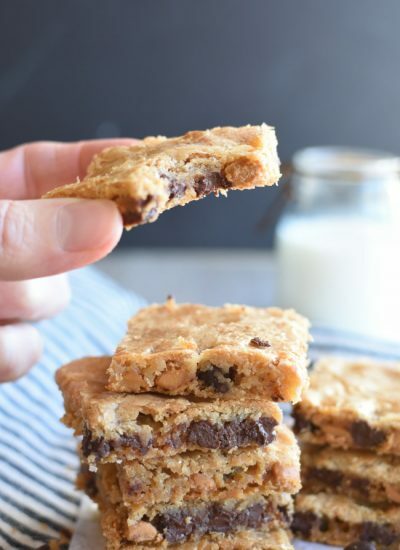 You can either use sugar cookie mix, refrigerated cookie dough or make sugar cookie dough from scratch. I decide which to use depending on how much time I have!